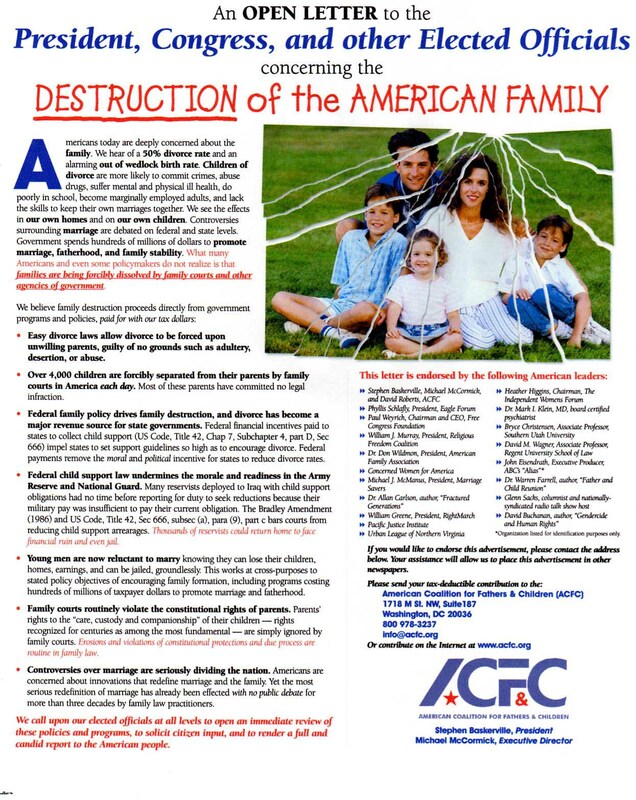 Yesterday, Monday, March 28, 2005, a second ACFC newspaper advertisement ran in the Washington Times National Weekly Edition. The ad will be repeated next Monday, April 4. Dr. Allan Carlson, author, "Fractured Generations"
John Eisendrath, Executive Producer, ABC's "Alias"
Dr. Warren Farrell, author, "Father and Child Reunion"
David Buchanan, author, "Gendercide and Human Rights"
These names cannot be ignored. These are eminent leaders who speak to the President and members of Congress on a regular basis. They head organizations with hundreds of thousands of members and followers. These leaders are sticking their necks out for us. They sympathize with our plight, support our efforts, and are willing to back us further. It is now up to us to act. These people cannot fight our battle for us. We are now on the national stage, and what we do will be seen by the world. This ad presents an inescapable choice to elected officials: Either our charges are without merit, in which case why are they being endorsed by leaders of this stature? Or our charges are true, in which case a major national scandal is being ignored by our elected officials. Either way, it demands attention, and that is all we are demanding: An investigation into allegations of government wrongdoing alleged by millions of American citizens and a full report to the American people. Copy this ad and circulate it to your elected officials and to the media. Solicit local endorsements, and run the ad in your own local newspapers. Some of the organizations listed above have local affiliates. Contact them and offer to create a coalition for mutual support. 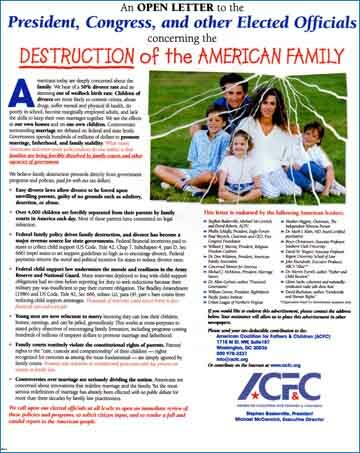 Go to www.acfc.org and make a contribution in support of these efforts. Forward this email to ten other people who have been affected by the family law system and ask them to consider supporting the effort also. We have major support among national leaders in Washington. We have only to act and act responsibly, and the door will swing open to us. These endorsements demonstrate that we have now accumulated perhaps the most valuable commodity in politics: trust. These leaders trust that we are telling the truth about these abuses. They know our allegations have not been refuted and cannot be refuted. It has taken years to acquire this trust, and it cannot easily be built up again. We must now invest this "political capital" or it is wasted. Our thanks again to Dr. Mark Klein. For more than 40 articles on families and fathers, see: www.stephenbaskerville.net. See also the index at Fathers for Life for Stephen Baskerville's articles.